"Greetings, welcome to the Bags store @ Boulevard. Fashionable is the keyword for our buyers who have selected some trendy looking and definitely practical bags for sale here. You are sure to find a bag for each of your modern activity. We will have something for your work, play and traveling occasions. Feel free to browse by clicking on each bag and I�ll be happy to give you a little more information." 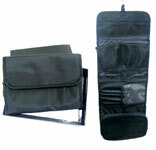 "Classic black 3-fold toiletries bag that will keep all your traveling necessities where you want them! Great gift item for all who live it up, traveling for work or leisure. The Bag Store @ Boulevard price : $5.9 ea." "Fun toiletries pouch for a short getaway! A great giveaway as well in view of its value price. The Bag Store @ Boulevard price : $4.5 ea." "A great companion for your weekly gym or yoga lessons! Size fits all types of sports and leisure activity shoes. "The best event bag for the outdoors! Waterproof and light, it is great for a day out at the beach or by the pool. Excellent for outdoor event giveaways! The Bag Store @ Boulevard price : $2.9 ea." "The best exhibition and event bag! Sturdy and classy, it holds brochures well at trade shows and doubles as an excellent miscellaneous or groceries bag. Long marketing shelf life! "A much cherished bag that screams style all round. Made of PU leather and carefully polished finish, this bag is a great companion for all avid golfers. 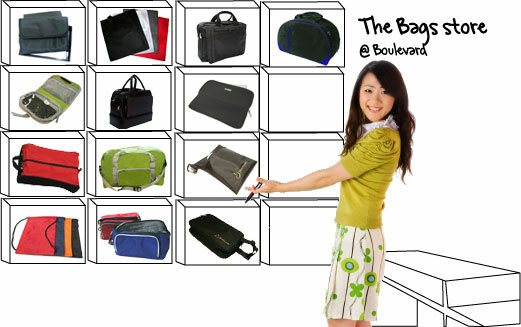 The Bag Store @ Boulevard price : $24.9 ea." "An excellent bag for the shopping enthusiast! Folds into a slim pack that slips easily into your luggage. Expand when required for durable storage space! The Bag Store @ Boulevard price : $7.9 ea." "Another great day out at the beach! Keeps 6 cans of beer or cola cool for the day. Fun colours! "There are several models in the market, but this one much sure stand out for its elegance. Priced a little higher than the usual, but well worth its price. The Bag Store @ Boulevard price : $16.9 ea." 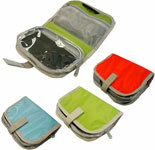 "Great sleek carrier to protect your laptop as you slot it into your backpack. Great for quick carries across meetings and lecture halls. The Bag Store @ Boulevard price : $10.9 ea." "Comes with a carabiner for quick attachment to your golf bag. Holds 3 golf balls comfortably with your usual tees and pickers. "An utility pouch that allows you to easily clip onto your golf or sports bag. Holds your mobile phone, keys, wallet, sporting gloves and a bottle of water comfortably. Practical for all sports enthusiasts! 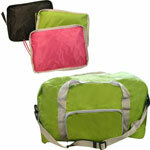 "Great sized sports bag that will carry your sporting gear. Even comes with a U-compartment for your sporting shoes! Fits most regular gym lockers. The Bag Store @ Boulevard price : $11.9 ea." All prices are quoted for a minimum order of 100 pieces, and are wholesale prices with no customization costs included. Customization costs start from $85 per job. Bulk discounts are applicable. Prices are also quoted whilst stocks last. Please check with us our stock situation prior to placing an order. If stock is available, our usual delivery time is 10 working days after your provision of the final logo artwork. Delivering the products to you is provided with our compliments. Contact us should you require samples for consideration.